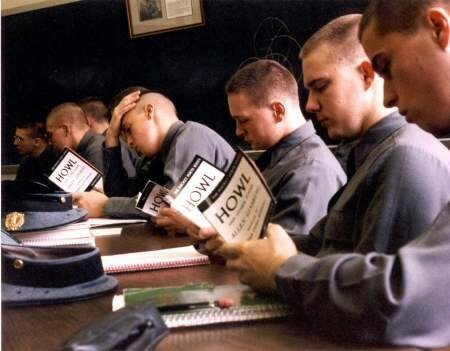 Cadets read Howl, February 19, 1991, Virginia Military Institute, Lexington, Virginia. Photo Copyright © Gordon Ball, 2006. From the mid-sixties on through, photographer Gordon Ball took thousands of photos of Allen Ginsberg and his many friends and colleagues: Robert Creeley, Lawrence Ferlinghetti, Gregory Corso, Peter Orlovsky, Herbert Huncke, Philip Whalen, William S. Burroughs, and many others. More here in Jacket 33. Man believed to be Ern Malley, Sydney to Melbourne night express, 29 April 1941, Sun Photo Archive. Poet Carl Rakosi died on Friday afternoon 25 June 2004 at the age of 100, after a series of strokes, in his home in San Francisco. [Some eight months before,] My wife Lyn and I were passing through California in November 2003, and we stopped by to have a coffee with Carl at his home in Sunset. By a lucky coincidence, it happened to be his 100th birthday. He was, as always, kind, thoughtful, bright and alert, and as sharp as a pin. We felt privileged to know him. 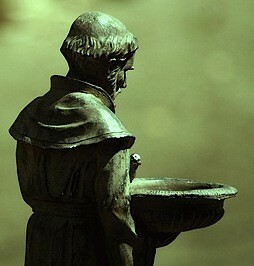 When he ceded control of the group, Francis [Saint Francis of Assisi, AD 1181–1226] hoped that he could still lead the men by example, but his influence quickly waned. This enraged him. “Who are these who have ripped my order and my brothers out of my hands?” he shouted. Once, when he saw a new building that he thought the community had erected for itself, in disregard of the rule of poverty, he climbed up to the roof and began prying off the tiles and throwing them to the ground. Breaking with his earlier, gentle practice, he cursed people who opposed his ideas. 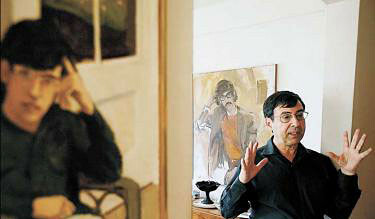 David Shapiro lives surrounded by art and music. Photo by Claudio Papapietro for the Riverdale Press, copyright © Claudio Papapietro and the Riverdale Press, 2009. Used with permission. John Tranter founded this magazine in 1997. He has published more than twenty collections of verse, and has edited a number of poetry anthologies. His book «Urban Myths:210 Poems: New and Selected» (2006) won a number of major Australian prizes, and his latest book, «Starlight: 150 Poems», won the Melbourne «Age» Book of the Year poetry award and the Queensland Premier's Award for Poetry, both in 2011. As well as writing and editing poetry he has been a teacher, a publisher's editor, and a radio producer. In October 1997 he founded the free Internet magazine «Jacket», and in 2010, after forty published issues, he granted «Jacket» to the University of Pennsylvania in Philadelphia where it grows and flourishes as «Jacket2». In his spare time he founded the Australian Poetry Library at http://poetrylibrary.edu.au/ which publishes over 40,000 Australian poems online. He is a Doctor of Creative Arts and is an Honorary Associate in the University of Sydney School of Letters, Arts and Media, and an honorary member of the Australian Academy of the Humanities. He is married with two children and currently lives in Sydney. Please feel free to browse by his Journal at johntranter.net and his vast homepage at johntranter.com. From John Tranter: Hi. I have been asked to write a Commentary for «Jacket2» for a few months, starting in October 2012. Generally I sit in a rocker on the back porch, sipping from a jug of hooch and making wisecracks through the screen door; I guess the editors want to make me more useful. Well, hang around. I plan to look at some history -- how did I get here? -- and look at some of my favorite items in the forty issues of «Jacket» which I edited, including British, Canadian, European, Spanish-American and Australian poetry and creative and critical writing, and the ferment of the USA, and from time to time I will talk about other things that interest me including photography, printing, typography and the management of the philosophical tendencies of the common capybara (Hydrochoerus hydrochaeris). Photo: Two capybaras anxiously discussing Wittgenstein's apparent rejection of some of the key propositions of his Tractatus Logico-Philosophicus (1921). Jacket2Commentaries feature invited posts by poets and scholars who take a close, serial look at poetry scenes, archives, poetic concerns, or theoretical clusters. Commentaries, although curated, are not edited by Jacket2 staff. We welcome your comments. Send queries and notes to Commentaries Editor Jessica Lowenthal or contact us at this page. »» Qwerty versus Dvorak: The Dvorak keyboard is much better, right? Wrong. One from each side of the Atlantic! Okay, I take it all back.